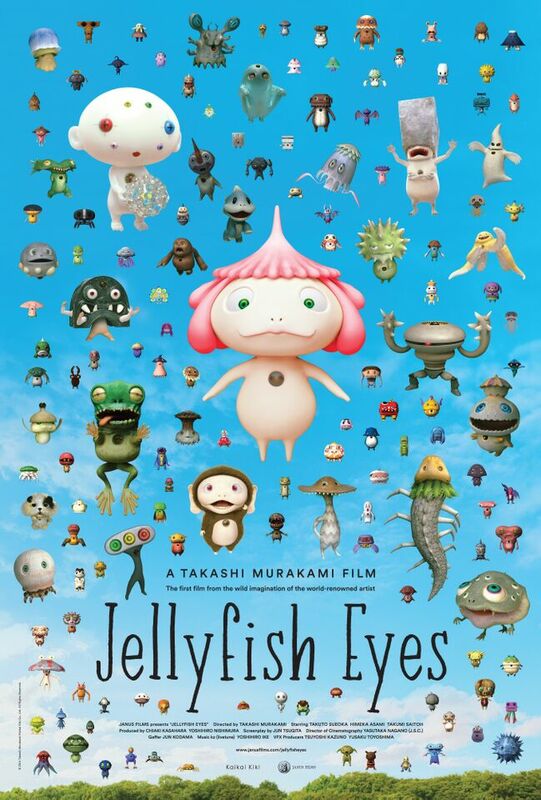 I’ve been a fan of the artwork of Japanese artist Takashi Murakami and his “superflat” pop-art inspired characters, so the potential to see them come alive in his new directorial debut Jellyfish Eyes was an interesting prospect. In the U.S., Murakami might be best known for his cover of Kanye West’s Graduation album and his collaboration with Louis Vuitton, but he’s been a rising star in the art world for years. Jellyfish Eyes is a children’s film which is a blend between early to mid career Steven Spielberg films with popular Japanese crossover icons like Godzilla, Miyazaki, and Pokemon. The film centers around a young boy Masashi who moves to a small new town with his mother after the death of his father and soon after finds a friendly, flying, sprite which resembles a jellyfish. He names the sprite Kurage-bo and soon after finds all the kids in this small town have what he learns to be F.R.I.E.N.D.S. and not all of whom are so friendly. The film’s mix of animated characters with live action is a bit odd at first but then again so is the plot so it’s easy to suspend disbelief with all the fantasy elements. Jellyfish Eyes merges parts of Japan’s kawaii (cute) culture with the action of anime and some darker real-world realities like bullying and post-Fukushima energy into an off-beat lesson for kids. The biggest issue with the film is that it takes on too much trying to mix big issues with a classic kids film and anime while trying to stay kid-friendly, which at times is jarring. If you’re a fan of Japanimation or of Murakami’s it is definitely a film to catch for the creative characters alone. Jellyfish Eyes is now on DVD and )n-Demand video streaming services.